Hip to The Blues Book 2 published by Santorella Publications is everything you enjoyed and appreciated from the first series and more. 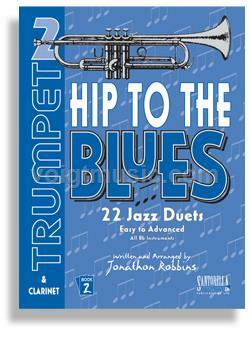 With 22 new jazz duets edited and arranged by Jonathon Robbins, this time written in accommodating keys. All three winds (Eb, Bb & C) have the ability to play together in any combination. The CD is recorded in the same fashion as Volume 1 whereas the duet is played in entirety (both parts) if your stereo is evenly balanced. Move the balance to right or left channel to isolate the top or bottom (1st or 2nd) part and play along with Chris Tedesco, one of the best studio trumpet players in Los Angeles today. Originally written for trumpet, so this is where this whole series all began. Includes the following Jonathon Robbins originals; The Five Seventeen • Blue Boppin' Bossa • Assembly Line • Ba-do-ba-dee-bop • Lazy Summer • Two Note Blues • Mr. Modulation • Strolling Down the Avenue • The "Do Nothing" Blues • Road Trip • Runaway Blues • Hazy Sunset • Rainy Afternoon Blues • Blue Lullaby • Variations • Monday Morning Blues • I can't Stop • Making the Best of It • Kickin' Back • Deep in Thought • The River Keeper Blues • Until Next Time About Chris Tedesco Chris Tedesco has distinguished himself as a soloist, chamber artist, orchestral & commercial trumpeter in Los Angeles for over 20 years. His early classical training included studies with Chuck Lirette of the Buffalo Philharmonic and college training with Gilbert Johnson, (former principal trumpet of the Philadelphia Philharmonic) at the University of Miami in Florida. Chris Tedesco’s road travels included concert tours with the Glenn Miller Band, Tommy Dorsey Orchestra, but it was Cruise Ships that brought him to Los Angeles in 1987. Chris Tedesco can be heard on the movie soundtracks of Finding Nemo, Road to Perdition, Boat Trip, The Mexican, Best in Show, Ring of Fire, After the Storm, Durango Kids, Winchell, Absolute Power, Star Trek - First Contact, Nixon, Stonebrook, Heaven and Earth, Cool World and Lorenzoâ€˜s Oil. On the small screen you can hear his solo Trumpet on the theme to the hit TV show “The District” along with many national TV commercials. Chris Tedesco has recorded with Joe Cocker, Natalie Merchant, Ellis Hall, Royal Crown Revue, Pat Boone, Cher, Brian Setzer, Dwight Yoakum, Juan Carlos Quintero, Thom Rotella, Jump with Joey, Leslie Paula, Boom Shaka and forThe Disney Afternoon.